﻿I woke up in the middle of the night with a fever and feeling of death. So this is going to be short and sweet. 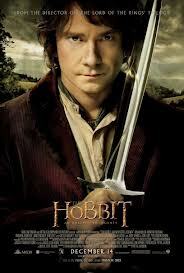 I saw "The Hobbit: An Unexpected Journey" on Friday. It was quite enjoyable and did not feel drawn out at all. I have a feeling that the third flick will focus on the Battle of the Five Armies. A lot of the extra material in the film is taken from the LOTR appendices and the "prequal" story The Quest of Erebor. I did not see it in 3D as my disdain for that format is well known. Therefor I can not comment on the 48 frames per second controversy. I am off to self medicate and sleep so throw your opinions of the movie down in the comments or on our Facebook page. Also check out That F'ing Monkey Podcast and let me know what you think. I'm glad to hear you enjoyed it, I had some concerns. Hope you're feeling better today! Have some whiskey tea before bedtime. It makes everything feel better!